I’ve made a lot of progress today, adding support for streaming content from .BAR archive files, reading .DDT texture files (except for the DXT sub-formats), and building an XDocument from .XMB files. 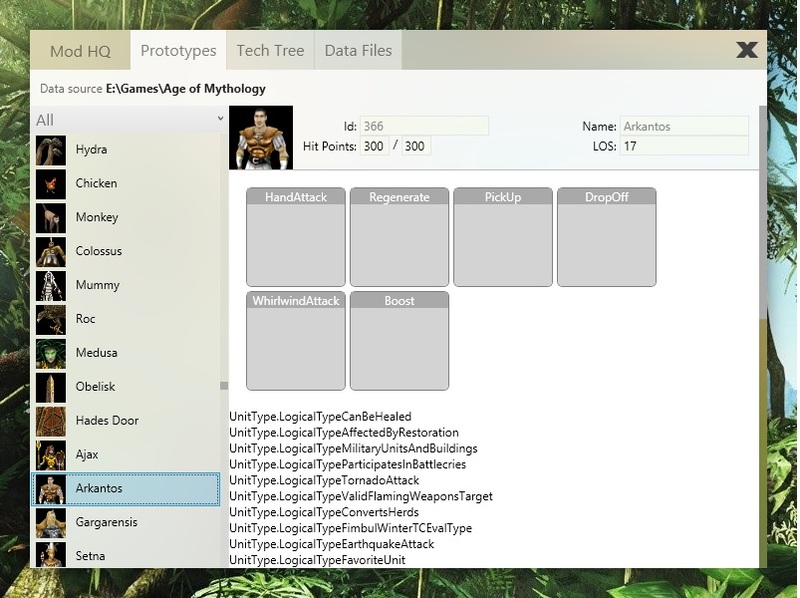 The project was updated so that it can be pointed at the Age Of Mythology game folder, and it will extract all the data it needs; no need to use BAR explorer or AOMEd to get the data in a more usable format. DDT files are a container for image data of a number of formats (uncompressed, Palette, Grayscale, DXT formats). It starts off with a short header, then optionally some palette data, and finally the image data. The interface was also tweaked a little, adding images for units, a filter to show only units or buildings, and some more tabs for when more functionality is added. Download, click Data source, and point it to your Age of Mythology directory. Note to self: WPF ListBox bug appears when the parent Grid has multiple rows AND columns.